Nickel prices, inventory, reserves, ore types, cost curves, and demand versus supply discussed. 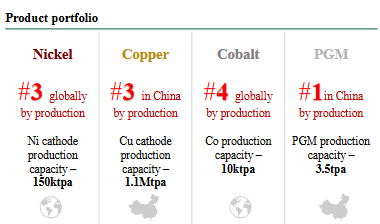 Top 5 global nickel producers reviewed. 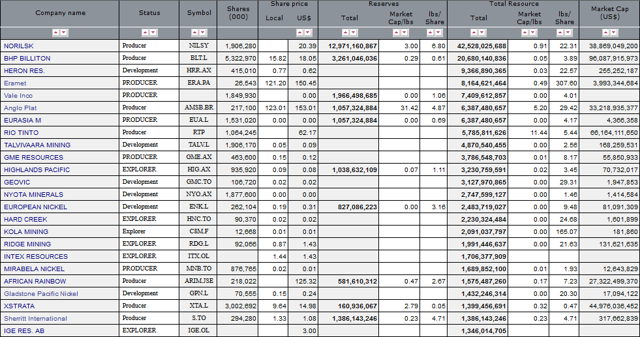 Smaller nickel producers and promising juniors listed. This article first appeared on Trend Investing on January 2, 2019; therefore all data is as of that date. Given the current negative sentiment due to the US-China trade war and some slowdown in China, nickel prices have fallen to a low level, as have the nickel miners. Provided we don't head into a large China or global slowdown, then any resolution in the trade war and China should lead to some recovery in nickel prices and the nickel producers stock prices. Furthermore as we move to 2020 and beyond, electric vehicle batteries should give a significant boost in nickel demand, notably from class 1 nickel ideally sourced from nickel sulphide ore. The chart below shows nickel inventory levels have declined and are now back to 2013 levels when the nickel price was ~USD 6-8/lb. The chart below (not updated) shows the top 5 global nickel miners by resource. NB: Heron Resources spun out their nickel-cobalt project to Ardea Resources [ASX:ARL] (OTCPK:ARRRF). Class 1 nickel is the high purity nickel that is used in electric vehicle lithium ion batteries. The stainless steel industry uses both class 1 and class 2 (lower purity) nickel, and is the main driver of nickel demand. The nickel sulphide ore deposits are the better source for class 1 nickel needed to make nickel sulphate for EV batteries, and typically have significantly lower production and CapEx costs. Class 2 nickel from nickel laterite ores can be converted to nickel sulphate however it requires high pressure acid leaching [HPAL], which is expensive with much larger CapEx requirements. Much of the laterite ores come from the rim of fire regions such as Philippines, Indonesia [PNG] and New Caledonia. Most of the sulphide ores come from Russia, Canada, and Australia. Currently, class 1 nickel supply suitable for battery production represents approximately half of global supply of 2.1 million metric tons [MT] – although only 350 metric kilotons [KT] is available to be processed into powder and briquettes that could be used to produce nickel sulphate (in 2017 approximately 65 Kt to 75 Kt of nickel content will be used to make nickel sulphate). With annual EV production expected to reach 31 million vehicles by 2025, demand for high-purity class 1 nickel may increase significantly from 33 Kt in 2017 to 570 Kt in 2025. This comes on top of class 1 demand from traditional end-use segments i.e., plating, foundry and super-alloys. 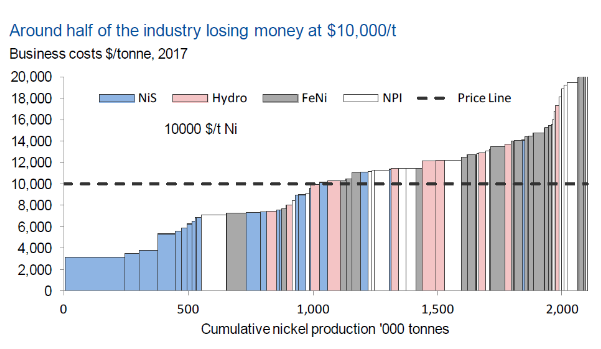 A shortfall in class 1 nickel production seems increasingly likely as current low nickel prices do not support class 1 nickel capacity expansions and alternative strategies e.g., shifting existing production from nickel cathode to nickel sulfate or refining nickel intermediates, seem unlikely to provide long term solutions. As a result, not only will nickel prices likely need to move towards incentive pricing but the future pricing mechanism is likely to reflect two distinct nickel products: class 1 and class 2. A shortage of class 1 nickel will likely see pricing revert to incentive pricing levels required for the introduction of new capacity or the reopening of mothballed capacity. These incentive pricing levels will need to be above current nickel prices and could increase significantly if the supply-side response is slow. At the same time we expect to see two distinct nickel price mechanisms emerge reflecting two distinct commodities: class 2 nickel, primarily for use in stainless steel production, trading at a lower price that reflects its abundant supply; and class 1 nickel trading at LME prices – or above for high-end nickel powders and pellets used to make nickel sulfates – reflecting required incentive prices. The key thing to understand here is that the nickel sulphide ore miners have a distinct cost advantage when producing the nickel sulphate required for EV batteries. The two biggest global districts of nickel sulphide deposits are Sudbury in Ontario, Canada, and Noril’sk-Talnakh in Russia. Note: Nova Bollinger is owned by Independence Group [ASX:IGO] (OTC:IIDDY), Dumont by RNC Minerals [TSX:RNX] (OTCQX:RNKLF) and Waterton Group (private). The chart below shows Norilsk Nickel is by far leading (lowest cost) on the cost curve for nickel production. The reason for this is their sulphide ore and strong by-product credits from other key metals such as copper, palladium, and some cobalt. By far the main demand source for nickel is stainless steel. This means nickel demand will continue to be driven largely by global construction demand, still led by China for now. However, what is significant is that increasingly new demand will be driven from lithium-ion battery demand, fueled by growth in electric vehicles and energy storage. Assumes that by end 2020 light electric car sales can reach 5 million pa. Based on 36 kgs of nickel per electric car that equates to 180,0000 tonnes pa of nickel required to feed electric cars in 2020, or about 7% of total nickel demand up from almost zero in 2015. The message here is that nickel demand from surging electric car sales will start to become significant by 2020 at ~7%, more important by 2025 at ~17%, and very significant by 2030 at 26%. Metal Bulletin reported UBS states: "Consumption of nickel for batteries would total 665,000 tonnes in 2025, compared with 60,000 tonnes currently, according to the bank. This would push total nickel use to 3.1 million tpy from 2.2 million tpy." Note that is an 11 fold increase in battery grade nickel between now and 2025. Glencore (OTCPK:GLCNF) [LSX:GLEN] stated in late 2016 they see "a shortage in nickel arising as a result of burgeoning demand from electric vehicle [EV] production. 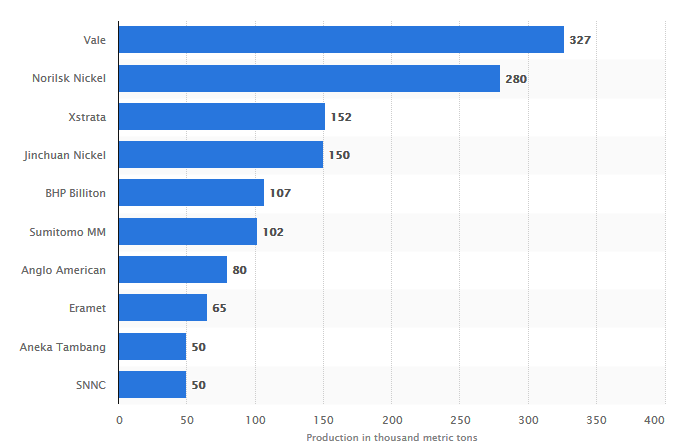 Batteries used in EVs are consuming about 100,000t of nickel demand and if 10% of the world’s vehicle fleet transitions to electric power, 400,000t of nickel would be required on current yearly production of 1.95-million tonnes." 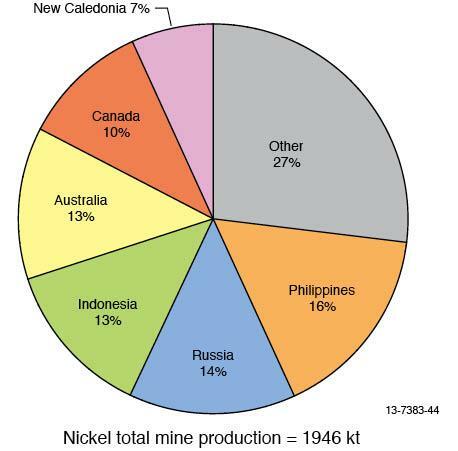 The pie chart below shows the main sources of nickel supply by country (despite being a bit out of date it still gives a reasonable guide) - the big five being Philippines, Russia, Indonesia, Australia, and Canada. Vale [BZ: VALE3](NYSE:VALE) state that more than $70 billion of investment in nickel mining was needed to bring new production to the market to meet future EV demand. In the case of nickel mining, it would require prices "above $20,000/mt sustained to incentivize such investment". The current price is US$10,590/t. The chart below shows nickel is forecast to be in deficit after ~2022 (or at least require new supply to come online). 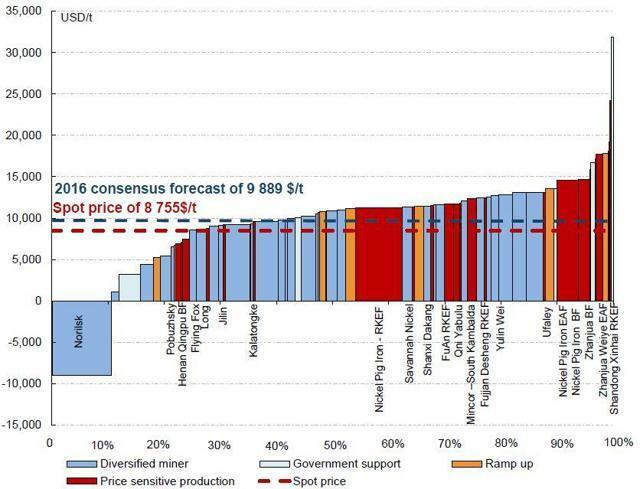 Note: Xstrata was taken over by Glencore, so the chart is now a bit out of date but a useful guide. Vale is a Brazilian company mostly known as one of the top 3 global iron ore producers. 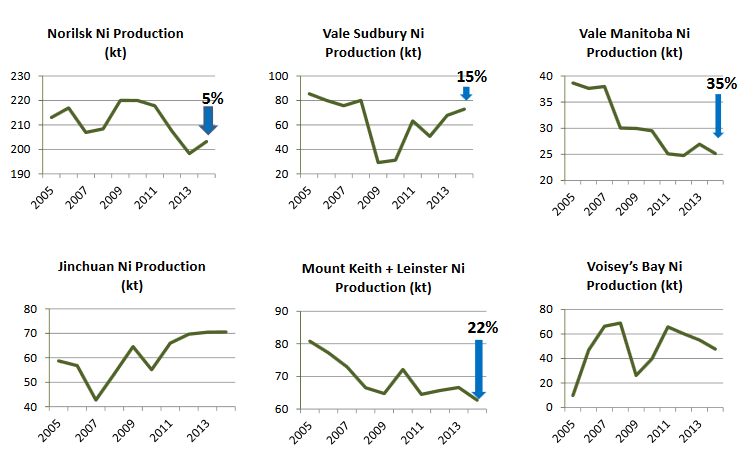 Vale is ranked the global number 1 nickel producer, and is forecasting a production of 244kt of nickel in 2019. Vale state they plan to grow this to 400ktpa in the mid-term, mostly from a US$1.7b Voisey's Bay expansion plan to boost their nickel production. 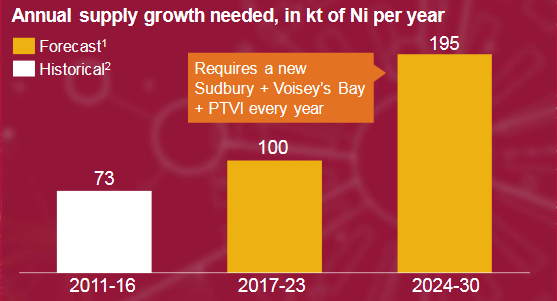 Vale's Voisey's Bay and Sudbury nickel production comes from nickel sulphide ore.
Vale achieves the vast majority of their revenue (74%) from ferrous metals (mostly iron ore). Base metals (mostly copper and nickel) bring in just 20.2%, meaning Vale is predominantly an iron ore producer with some nickel, copper, and coal revenues. Vale's Base Metals business includes an extensive chain of mines, mills, smelters and refineries. Given that Vale is a premium producer with 60% of its production being Class I nickel and an increasing exposure to EVs (electric vehicles). ...The production guidance for 2018 was reduced from the 263 kt announced in the Vale Day presentation to 250 kt (as per the latest production and sales Report for 2Q18). This reduction is a consequence of Vale's focus on improving its margins by reducing the sale of Class I products to the stainless-steel market with low premiums, and by reducing Class II nickel products sold as intermediates, with high discounts for unfinished products. On October 15 Vale announced: "Record: Vale breaks production barrier of 100 Mt of iron ore in a quarter." Q3 nickel production was down as stated: "nickel operations in 3Q18 reflected planned one-off effects derived from Sudbury’s scheduled maintenance shutdown." You can view the complete Q3, 2018 production report here. Current market cap is US$69.7b, with an end 2018 debt estimate of US$10.23b. 2019 PE is 7.79 and 2020 PE is 8.05, with a 2019 estimated 5.74% dividend yield. 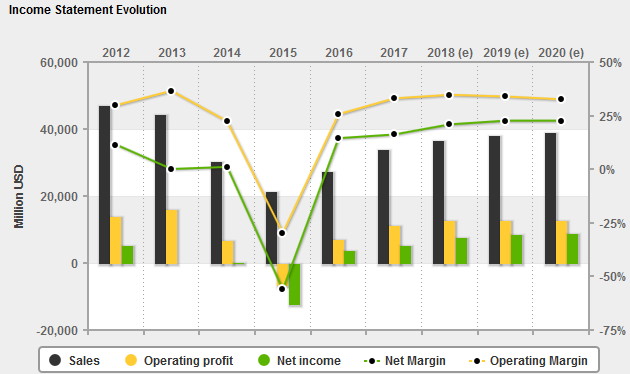 2019 net profit margin is forecast at 22.65%. Current consensus analyst price target is USD 17.55, representing 34% upside. Vale is a top tier nickel stock due to their No 1 global nickel producer status; however investors must remember that iron ore is by far the key driver of the stock. I like the stock as an iron ore play with a growing nickel revenue in future years. Valuation looks very reasonable, provided iron ore prices hold, which depends mostly on China and global growth (steel demand) remaining solid. China does have a glut of about 50 million empty apartments (~22% of China’s urban housing stock), so that is a concern. On the flip side it has been said that China infrastructure (including Belt & Road) is now consuming more steel than housing. Finally, the impact of the trade war and any tariffs on steel need to be considered. I view the stock as a buy only on any further cyclical weakness, and to then accumulate over time again on any further price weakness. My caution is due to the China empty apartment glut, and some current risks of a 2019 China growth slowdown if trade wars are not resolved. Norilsk Nickel is a large diversified Russian miner, and the global number 2 nickel producer with the world's largest nickel reserves. They are also the number 1 nickel low cost producer with the largest nickel sulfide deposit in the world. On April 13 Metal Bulletin reported: "US sanctions unlikely to affect Nornickel despite Rusal link – sources." Production results for 1H 2018. Norilsk Nickel Group announces preliminary consolidated production results for 3Q Quarter and 9 months of 2018. In 3Q18, consolidated nickel production amounted to 54kt, up 9% quarter-on-quarter (q-o-q). Nickel output from own Russian feed also increased 9% q-o-q to 53 kt. The growth was mainly attributed to increased production at Norilsk Nickel Harjavalta as the refinery returned to normal operations after scheduled repair works were carried out in 2Q18. In 9M 18, nickel output stayed almost flat year-on-year (y-o-y) at 157 kt. BASF and Nornickel join forces in European EV battery push. Germany’s BASF and Russian miner Norilsk Nickel have struck a nickel and cobalt supply deal to meet growing demand for electric vehicle (EV) batteries. Chemicals giant BASF will build a plant to produce cathode materials for batteries in Harjavalta, Finland, adjacent to a nickel and cobalt refinery owned by Nornickel, the world’s second-largest nickel miner and a major cobalt producer. Current market cap is US$29.7b, with a net debt of US$5.8b as of H1 2018. Net profit margin is very good at 23.28%. Current PE is 10.3, with a dividend yield of 5.17%. Analysts' consensus is an overweight, with a price target of US$20.87, representing 11% upside. Norilisk is a top tier nickel stock due to their number 2 global nickel producer status, industry low costs of production, and industry leading nickel sulphide reserves. At ~27% of revenue investors will also need to be neutral or positive on palladium and copper. Norilisk Nickel remains my number 1 nickel stock pick. You can read more in my recent article: "An Update On Norilsk Nickel". 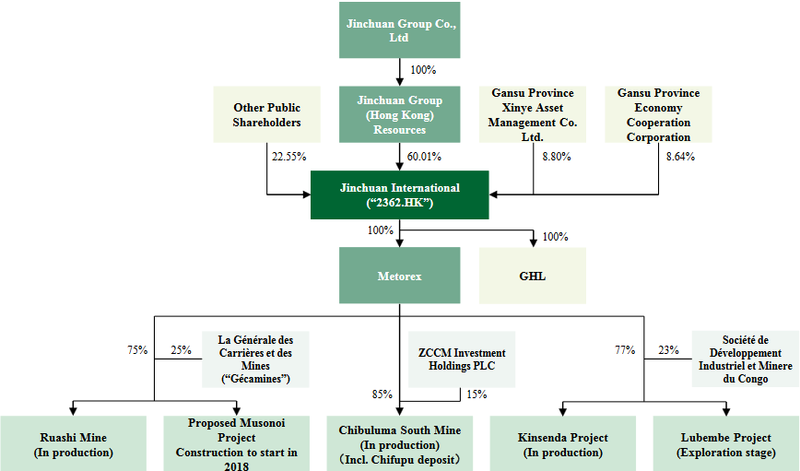 Jinchuan Group International Resources (“Jinchuan International”) is a majority-owned subsidiary of the Jinchuan Group. Jinchuan International is a large-scale non-ferrous mining conglomerate with an international presence, primarily engaged in mining, milling, smelting, chemical processing and further downstream processing; it also engages in trading of mineral and metal products which could complement its mining operations. 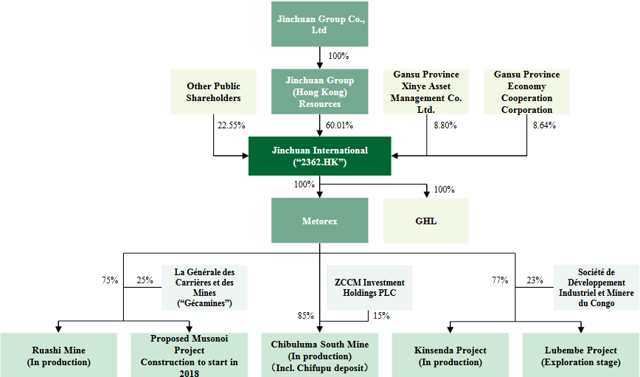 Jinchuan International owns the world’s 3rd largest copper-nickel sulphide deposit located in the DRC. Jinchuan International is the global number 3 nickel producer, and also a significant copper, cobalt and platinum group metals [PGM] producer. Via its subsidiary–Metorex, Jinchuan International owns a number of large-scale high-quality copper and cobalt mines in Africa, and engaged in production and trading of base metals. Jinchuan Group, China's top nickel producer, will next year start building a new project in Guangxi. The project, in the southern port city of Fangchenggang, where Jinchuan already smelts copper and nickel, will have annual production of 30,000 tonnes of nickel and 3,000 tonnes of cobalt by 2020. The company's three main metals "are all raw materials for electric cars," Wang said, forecasting "explosive growth" in EVs in China over the next five-10 years. "We really feel the decline of momentum in traditional industries. At the same time, we deeply feel...the strategic transformation brought by the new economy," he said, describing the EV revolution as a "turning point" for Jinchuan that would have a "far-reaching" impact on the company, based in Gansu in northwest China. By 2020, Jinchuan's laterite - a clay like substance from which metal can be extracted - project in Indonesia, in which it holds 60 percent alongside a local partner, will have production capacity of 50,000 tonnes of nickel and 5,000 tonnes of cobalt, said Wang. Combined with the new Fangchenggang project, that will help Jinchuan increase production of cobalt for batteries from 8,000 tonnes this year to 20,000 tonnes by 2020, when its nickel sulfate production will reach 300,000 tonnes. The company currently produces 150,000 tonnes per year of nickel. Via listed arm Jinchuan Group International Resources, Jinchuan also has copper and cobalt mines in Africa, where rival Jiangxi Copper is looking to invest. Current market cap is HKD 7.82b. Current PE is 10.99. I was unable to get a consensus analyst price target. Jinchuan International is a large nickel producer with even larger copper production and some cobalt production. Risk lies with heavy exposure to the DRC and Zambia. Valuation looks appealing, but the DRC risk weighs. Glencore is the Swiss giant resources group and commodity trader, and the global number 4 nickel producer. 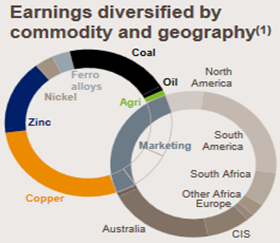 Nickel is only a relatively small percentage of Glencore's total revenues, with the main revenue drivers being their trading business ("marketing"), coal, copper, PGMs, zinc, nickel, and cobalt. Glencore's 2017 nickel production numbers are shown below. 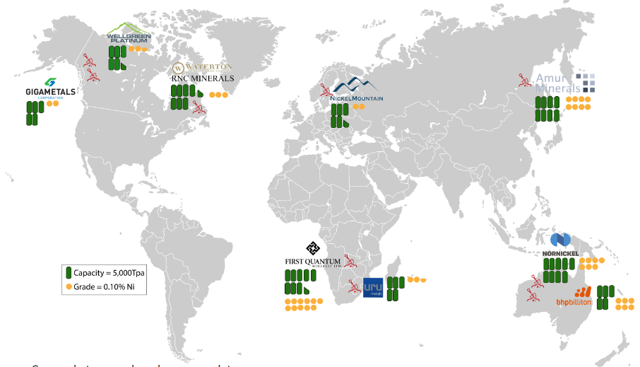 Glencore has nickel mines in Canada (Sudbury, Raglan), Australia (Murrin Murrin), and New Caledonia (Koniambo), with both sulphide and laterite ores. On July 31 Glencore announced: "2018 half-year production report. Own sourced nickel production of 62,200 tonnes was 11,000 tonnes (21%) higher than H1 2017, reflecting Koniambo's second processing line entering production and the scheduled statutory shutdown at Murrin in the base period." Glencore Third Quarter 2018 production report - "Own sourced nickel production was 10,200 tonnes [13%] higher than the comparable 2017 period." Current market cap is 40.8b, with an end 2018 debt estimate of US$25b. 2019 PE is 8.1 and 2020 PE is 8.2, with a 2019 estimated 5.78% dividend yield. 2019 net profit margin is forecast at 2.79%. Current consensus analyst price target is GBp 387, representing 40% upside. You can view a recent company presentation here. 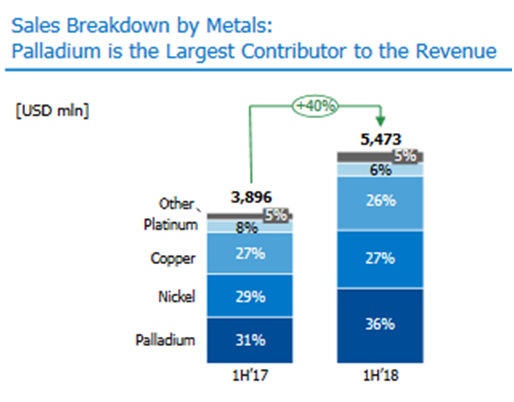 Glencore is the number 4 global nickel producer; however investors must remember that nickel is only a very small part of Glencore's current revenue. 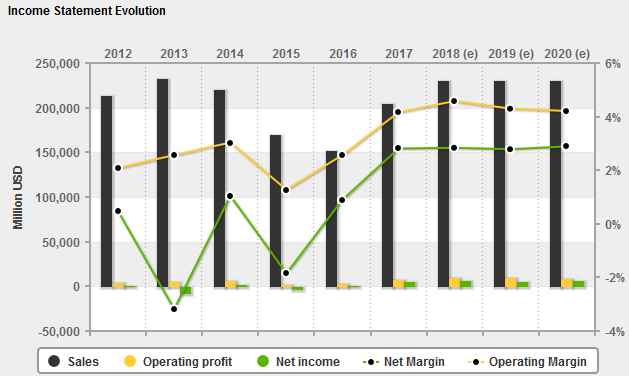 I like the stock long term due to their top quality assets and trading business; however in the short term they have some compliance issues, DRC tax increases, and a high debt, hence their current low PE. Not my preferred nickel play but still a solid EV metal play with good nickel assets. BHP is a very large Australian global diversified miner with huge low cost reserves especially in iron ore in Australia. 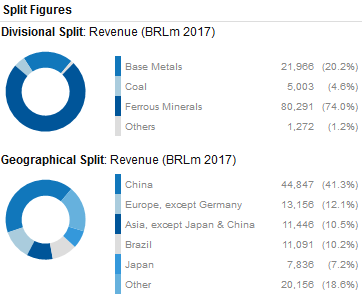 The main drivers of BHP's revenue are iron ore (35.0%), copper (31.4%), coal (21.0%) and petroleum (12.6%), noting BHP recently sold off their US shale assets for USD10.5b to BP. The whole shale assets exercise was a disaster for BHP, and the Company appears now to have realized this, and is focusing more on shareholder returns (including buybacks and dividends) as well as the EV metals. BHP has recently invested USD 43.2m at their Nickel West mine in Western Australia to enable their facility to convert class 1 soluble nickel into nickel sulfate. Nickel West (includes Mt Keith) has 6.2mt contained nickel metal in Resource, with an average grade of 0.58% Ni in sulphide ore.
BHP has plans to expand nickel sulphate production to meet future battery demand, with Stage 1 at Nickel West targeting expansion to 100ktpa nickel sulphate, and Stage 2 to follow. They also plan to produce some cobalt sulphate. You can read their August 2018 presentation - Nickel West: Think big A view to the future. On July 18 BHP announced: "BHP operational review for the year ended 30 June 2018. Nickel West production for the 2018 financial year increased by six per cent to 91 kt, with increased production at the Mt Keith and Leinster operations supporting record metal production. Nickel production for the 2019 financial year is expected to remain broadly unchanged from the 2018 financial year." On November 1 BHP announced: "BHP announces US$10.4 billion shareholder return program. BHP plans to return US$10.4 billion to its shareholders through the combination of an off-market buy-back and a special dividend." On December 16 4-traders reported: "BHP purchases 5% of stock in US$5.2 billion buyback funded by the sale of its U.S. shale unit." Current market cap is 160b, with an end 2018 debt estimate of US$10.9b. 2019 PE is 13.5 and 2020 PE is 14.3, with a 2019 estimated 8.96% dividend yield (note 2020 is forecast to drop to 5.13%). 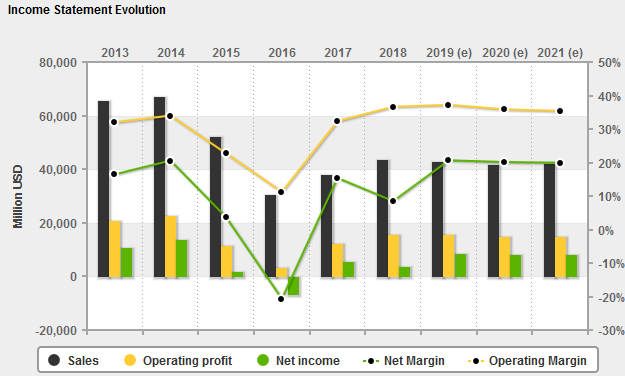 2019 net profit margin is forecast at 20.66%. Current consensus analyst price target is USD 26.52, representing 10% upside. BHP is a significant nickel producer; however investors must remember that iron ore, copper and coal are the significant revenue drivers with nickel not very significant at this time but set to grow. Valuation looks about fair. Axiom Mining [ASX:AVQ] (OTC:AXNNF), Amur Minerals Corp. [LSE:AMC] [GR:A7L] (OTCPK:AMMCF), RNC Minerals [TSX:RNX] (OTCQX:RNKLF), Panoramic Resources [ASX:PAN] (OTCPK:PANRF), Poseidon Nickel [ASX:POS] (OTC:PSDNF), Garibaldi Resources [TSXV:GGI] [GR:RQM] [LN:OUX6] (OTC:GGIFF), Sama Resources [TSXV: SME] (OTC:LNZCF), S2 Resources (ASX:S2R), Cassini Resources [ASX:CZI], North American Nickel [TSXV:NAN], Ardea Resources [ASX:ARL] (OTCPK:ARRRF), Artemis Resources [ASV:ARV], Australian Mines [ASX:AUZ], CleanTeQ [ASX:CLQ], Giga Metals [TSXV:GIGA], Mustang Minerals [TSXV:MUM], New Age Metals [TXV:NAM], Polymet Mining [TSX:POM], St George Mining Ltd [ASX:SGO] [GR:SOG], Transition Metals [TSXV:XTM], and Wall Bridge Mining [TSX:WM]. Nickel prices falling. Nickel prices are currently quite weak due to concerns on a China slowdown (China does have 65m vacant apartments), slower global growth, and some increased Indonesian supply expected soon. Philippines supply has been impacted by tougher environmental rules but is another risk to oversupply. On the positive side is declining inventories and accelerating demand from the battery sector mostly driven by the EV boom for nickel sulphate (sourced mostly from nickel sulphide). Mining risks - Production risks, exploration risks, funding risks, permitting risks, project delays. 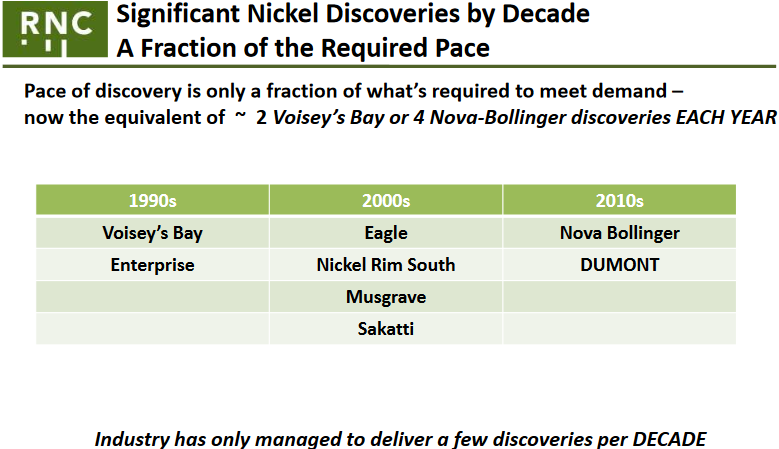 Nickel laterite projects typically require a large start-up CapEx. Sovereign risk - Highest in poorer corrupt countries (DRC, Africa). Stock market risks - Dilution, lack of liquidity (best to buy on local exchange), market sentiment (the trade war has negatively impacted most all metal markets in 2018). Increasing nickel demand and current constrained supply is resulting in a drawdown of nickel inventories; however the risk of an increase in class 2 nickel from Indonesia or Philippines has not helped nickel sentiment. Meanwhile a lack of nickel mine investment after a decade of suppressed nickel prices could lead to future supply shortages. In particular the demand for class 1 nickel ideally sourced from nickel sulphide mines is set to surge strongly as the EV boom takes off in the next decade, most likely leading to a pricing premium for nickel sulphate. UBS believes the demand increase for nickel in batteries is about 11 fold between now and 2025. My next article will look specifically at my top nickel sulphide miners and near term producers, as they will benefit most from the EV boom, which is really just getting started now, and will accelerate in the 2020s. For now this article has focused to highlight the top 5 global nickel producers which are Vale, Norilsk Nickel, Jinchuan International Group, Glencore, and BHP Group. 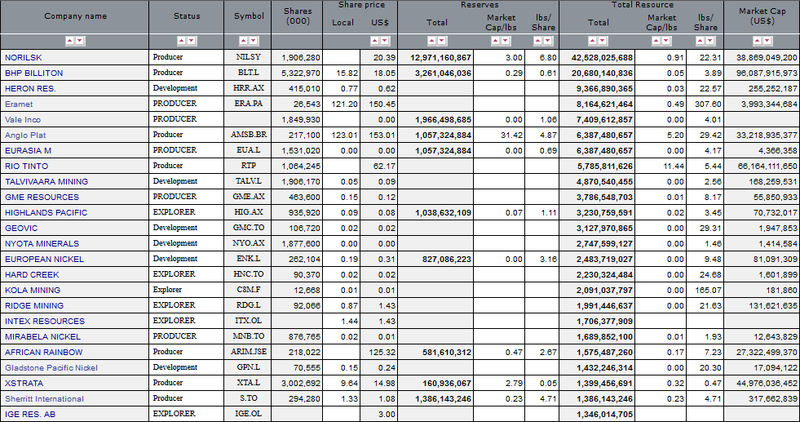 All are large and diversified miners. All 5 stand to benefit once nickel starts to recover most likely in 2019 or 2020 assuming no China or global slowdown. All mostly have nickel sulphide ore projects with lower operating costs. My top pick remains Norilsk Nickel due to their industry low cost nickel production mines from their world's largest nickel suplhide deposits. The other 4 are still solid nickel side bets with perhaps Vale my other preferred nickel play. 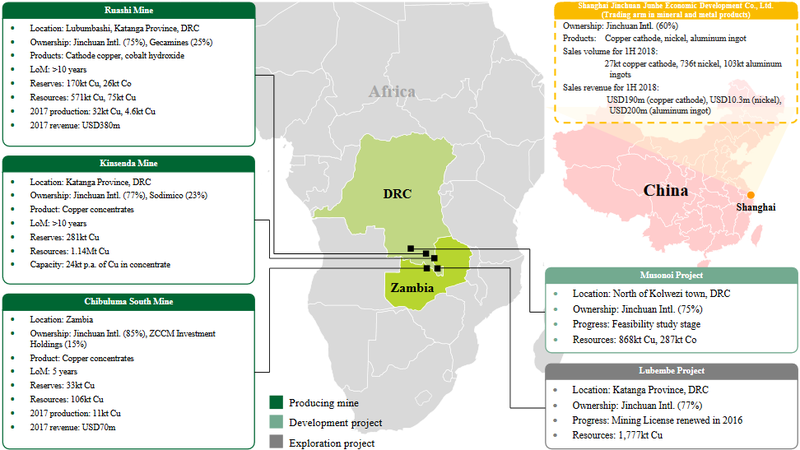 Investors need to remember that these are diversified miners and nickel is not the main driver of their revenues, and some have considerable sovereign risk notably with the DRC (Jinchuan and Glencore). Within the smaller nickel producers listed I would favor those that have sulphide ore projects in safe jurisdictions, such as Independence Group. Within the juniors I would apply the same parameters as above, but add those that are advanced, ideally with a clear path towards project funding, and some nice by-products such as cobalt. My preferred name would be RNC Minerals. I do still like Ardea Resources for their massive nickel-cobalt laterite resource in a safe jurisdiction. Similar thoughts for Australian Mines and CleanTeQ. Disclosure: I am/we are long NORILSK NICKEL [LSE:MNOD], GLENCORE [LSX:GLEN], RNC MINERALS [TSX:RNX], POSEIDON NICKEL [ASX:POS], SAMA RESOURCES [TSXV: SME], AXIOM MINING (ASX:AVQ), ARDEA RESOURCES [ASX:ARL], AUSTRALIAN MINES [ASX:AUZ]. I wrote this article myself, and it expresses my own opinions. I am not receiving compensation for it (other than from Seeking Alpha). I have no business relationship with any company whose stock is mentioned in this article.